I should not be sitting here, in the sofa, closer to 11 pm, after a long day, when I still haven’t even begun packing my trip to Stockholm tomorrow morning… but I am. Tonight was the first GIFTED book club meet-up after the summer, and the book of the day was Bury me standing by Isabel Fonseca. 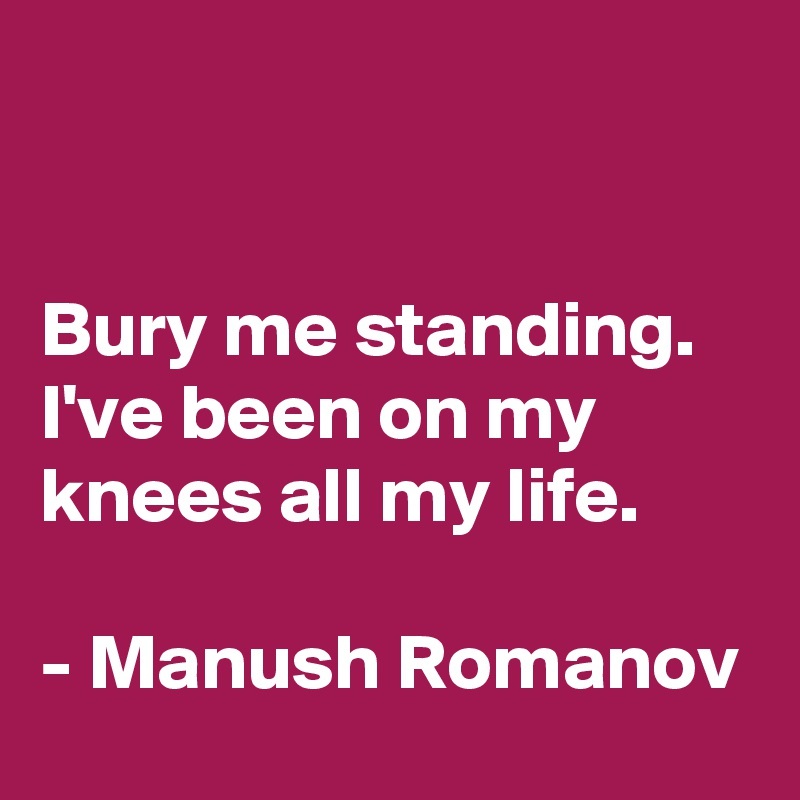 A Roma proverb by Manush Romanov, which he called out to Isabel at the end of a mutual visit in Sofia. First of all – this meet-up marks our one-year-anniversary, and I have to say, I’ve read books I most likely would not have read, had it not been for the book club. For that I am very grateful. It is one way to combat the narrowing of my filter bubble, for sure. 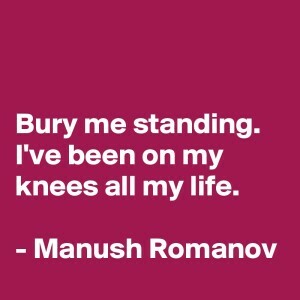 Secondly, Bury me standing is a daunting read. Informative, detailed, perplexing, shocking and sometimes even downright horrendous. It evokes so much in me, it’s hard to know where to start. But… I think…. maybe what strikes me first and foremost, is, truly, how hard it is for me to u n d e r s t a n d the Roma way of life, sentiment and culture. It is a culture very alien to me. Here we have a culture, a people (even though even the classification of the Roma as “a people” is not unproblematic in itself, see the quote below), that seem so foreign, to what almost all cultures across the globe have “assimilated into”. I mean, look at schooling. Most people across the globe go to school, regardless if you are 10 years old in Cuba, Nairobi, Shanghai or Malmö. And those schools, more or less, are very similar. Superficial differences exist for sure, but the basic structure is the same. And here we have a group of people, who just doesn’t buy into what I, what we, what the Western society (for lack of a better word), have deemed good, worthwhile, necessary. And from the book, it’s made perfectly clear (in all to graphic descriptions sometimes) how we have not been able to stand this, for five hundred years or so. In fact, it seems we’ve done our very best throughout the centuries to thwart every possibility for Gypsies (the term Isabel Fonseca uses throughout the book; the library copy I’m reading was published in 1996) to become a part of society. Shunning them. Ostracizing them. Killing them. Making up laws and regulations (still in effect today. I mean, t o d a y, in 2018!) that are specifically designed to make it as hard as possible for them to live their life, their way. Why can’t we live and let live? Why is “the other” so frightening to us? I don’t know. It’s hard even to write about this book. We did have a really good GIFTED conversation about it though, and somehow, I find it easier to talk about my thoughts, insights, questions and curiosities both towards the book and the Roma people, than to pin them down on paper. “The Jews have responded to persecution and dispersal with a monumental industry of remembrance. The Gypsies – with their peculiar picture of fatalism and the spirit, or wit, to seize the day – have made an art of forgetting. Outsider who, like me, have such a hard time understanding what it is we are seeing, that we cannot comprehend it. Perhaps (even likely) we cannot even see what it is we should, or could, be seeing, because our frame of reference is so vastly different. I hope, oh, how I hope, that the coming five hundred years will not be a continuation of what has gone on for far too long. So… what to do? Be there. Curiously. Non-judgmentally. Not wanting/needing/aiming to “solve the problem/s”. Letting go of the idea that the Western way of living is “the right way of living”, letting come… a broadened perspective? A deeper understanding? Self-determination (truly)?